3 Mills Studios is London’s largest film and television studio and is based on the historic and picturesque Three Mill Island in Bromley-by-Bow, east London. Three Mill Island is London’s oldest still-surviving industrial centre and is also home to The House Mill*, the largest and most powerful of the four remaining tidal mills in Britain. The wheels stopped turning in 1941, but there are plans to restore them, for power generation. Three Mill Island has an extensive history with evidence to suggest that the mills were listed in the Domesday Book and date back to the 11th century. During the Middle Ages, Stratford Langthorne Abbey acquired Three Mills Island and by the time Henry VIII dissolved the Abbey in the 1530s the mills were grinding flour for the bakers of Stratford, who were celebrated for the quality of their bread and supplied the huge London market. It is thought that the mills also produced gunpowder for a short period in the 1580s. During the 16th century the three mills were reduced to two and in the 17th century the mills began using the grain to distill alcohol and they became a major supplier to the alcohol trade and gin craze of London. Ownership changed relatively frequently during the 17th to late 19th centuries, until 1872 when the Nicholson family, already well established as a gin producer, acquired the site. Distilling ceased after the mills sustained severe air-raid damage during the Second World War, but the site continued to be used for bottling and warehousing by Nicholson, and from the early 1970s until the early 1990s, by Charrington and Hedges & Butler. This would normally be the end of a typical episode of London industrial history however the opposite happened at Three Mills Island. The majority of the island become a dedicated centre for film and television production with the establishment of Bow Studios, 3 Mills Island Studios and Edwin Shirley Productions in the 1980s. 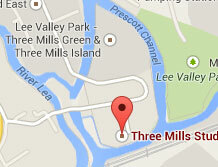 In the mid 1990s the three studios merged to become 3 Mills Studios under the management of Workspace Group Plc. In August 2004, the London Development Agency (LDA) acquired 3 Mills Studios, with ownership transferring to the Olympic Park Legacy Company (now London Legacy Development Corporation) in 2010. The LLDC is the organisation responsible for planning, developing and managing the Olympic Park after the 2012 Olympic Games. * The House Mill is a separate building to 3 Mills Studios and is owned and operated by the charitable trust, River Lea Tidal Mill Trust. The House Mill is open for tours at selected times.